What does it take to be the mascot for the York Revolution? A lot more than I’d thought. © 2012 by The York Daily Record/Sunday News. Jacob Arbittier, 16 of Dallastown, gets help from Rafael Vargas of Bronx, N.Y., and Rob McKinney of Dover before Arbittier's two-minute audition for the York Revolution's mascot DownTown on Saturday, Feb. 18, 2012, at Sovereign Bank Stadium. Nine hopefuls ranging in age from 16 to their mid-50s auditioned to play DownTown for at least 60 of the 70 home games this upcoming season at Sovereign Bank Stadium. As Jacob — who’s been the Wildcat mascot at his high school, Dallastown, since August — explained, people who play mascots need to make very exaggerated motions. People who are bad dancers are more likely to be good mascots. 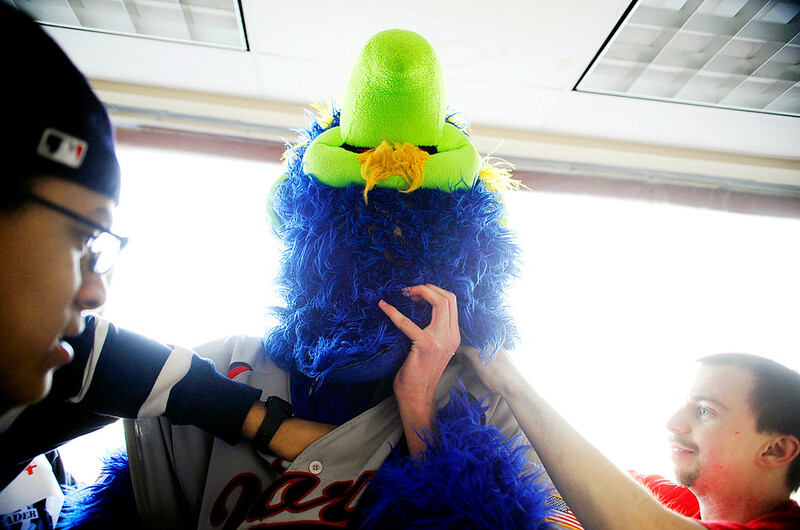 And yes, it’s a very fine line between being an awesome mascot and being a laughably bad mascot. Be sure to read Bill’s laughably good article about the auditions, which in part profiles another interesting candidate, as well as watch my video starring Jacob.